Sometimes a walk in the woods is more than a walk in the woods. 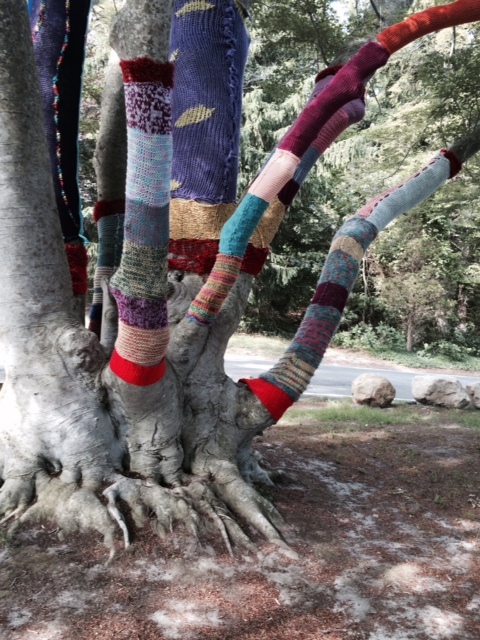 This week at Highfield Hall/Beebe Woods in Falmouth, MA, there was an outdoor art exhibit that knocked my socks (and sweater) off. 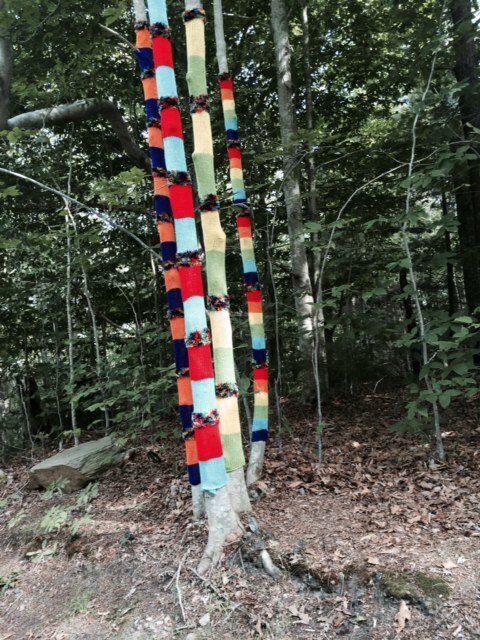 Trees were yarn-bombed with eye catching color and texture. 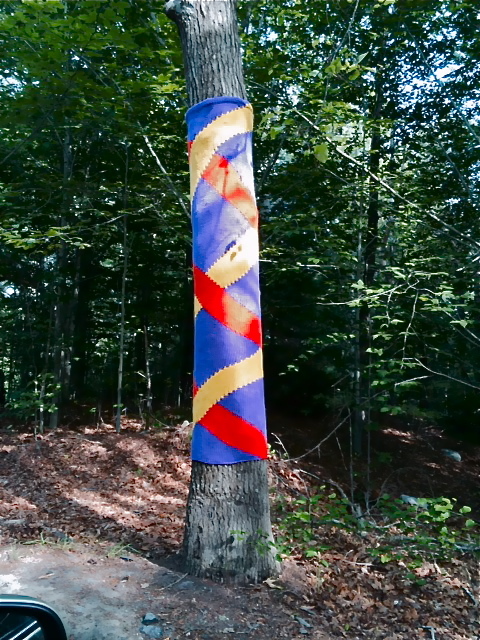 They surprised this visitor while traveling up the hill and, like magic, color popped on the sideways and byways– and all of it was hand knit or crocheted. The surprise element worked, and it was delightful. 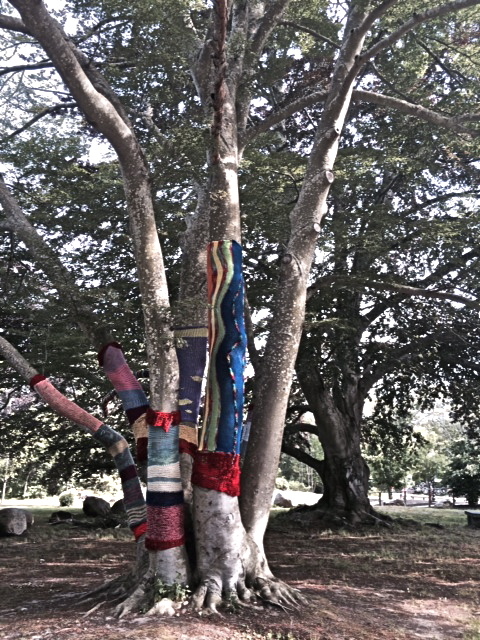 Of course, the exhibit doesn’t end here, but gave me the incentive to knit some cozies for trees in my own yard. My daughter Molly’s immediate response: “Do it, Mom! All of them.” Ahhhhh, the acorn doesn’t fall far from the tree! The design, color and texture of the yarnwork on the picture above is my favorite, maybe because it is so unexpected in such a bucolic environment. 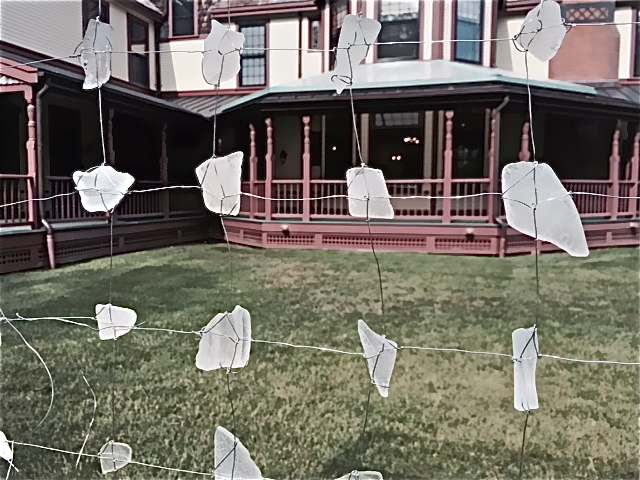 The yarnbombing wowed me, but the sea glass fragment house sent me to the moon and back. A zillion pieces of Mother Nature’s worn beauties are linked like jewelry and create a small house. From the outside, it glistens. 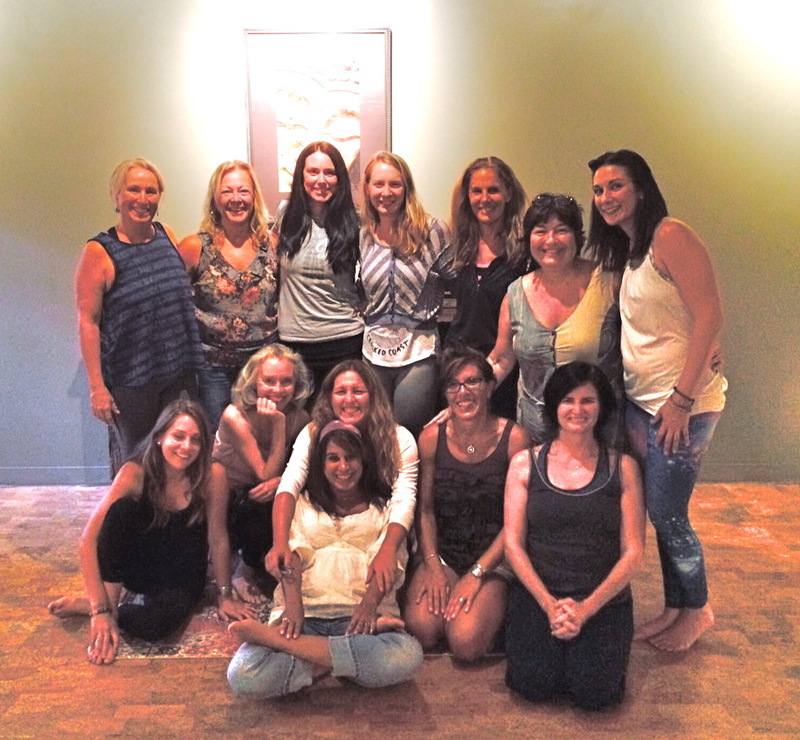 From inside, it provides an entirely new perspective to everything around it. 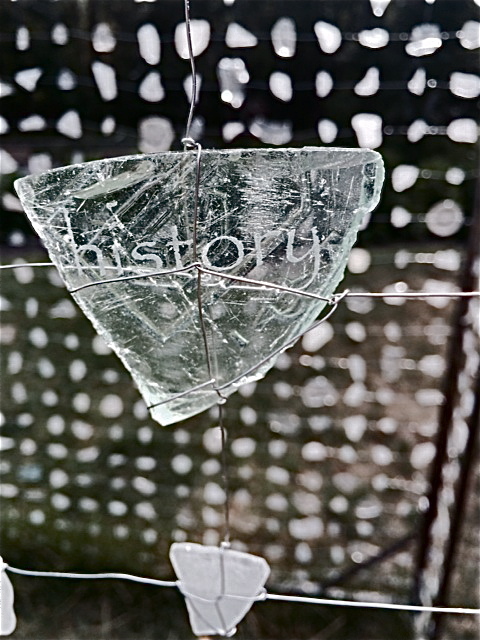 My eyes kept having to decide what to focus on: the intricate glass or the altered view of what existed outside of it. I did think about how much fun it would be to collect and build one of these gems, but after careful consideration, realized that I might want to finish the zillion unfinished projects already in my queue. Maybe not….started to collect pieces already, just saying. 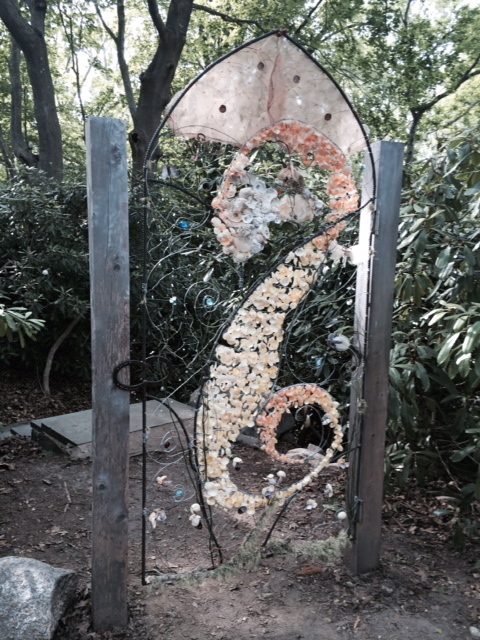 This last portal is a glorious gate created with shells and all kinds of found objects. It was a total surprise on my right as we meandered through Beebe Woods. I love the juxtaposition and the element of surprise. 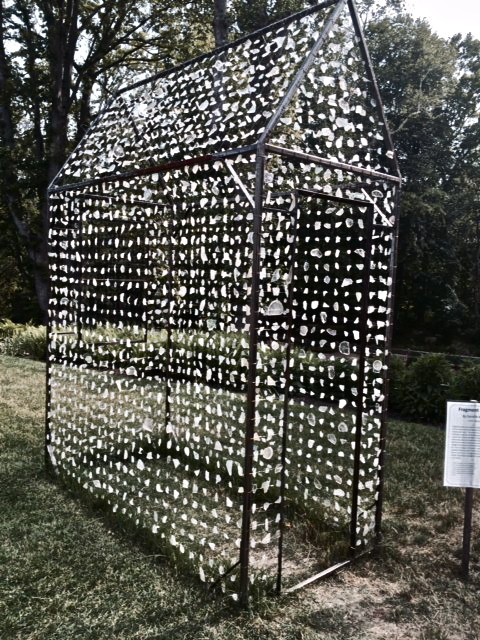 That’s what captured my attention throughout this walk… what a great composition of man made and nature made art. I want to go back again after the storm and see what it looks like. Posted in Beebe Woods, Cape, create, Explorer of the World, Highfield, simplify, Walkdoc. Bookmark the permalink.